President Pat White thanked members of the College’s leadership giving circle, the 1832 Society, Sunday by telling stories of three students whose lives have been transformed by the education and experiences they’ve received at Wabash. Micah Lembke, Filip Lempa, and Nathan Line, the president said, have accomplished things they never dreamed possible when they enrolled here from Griswold, Iowa, Poland, and Crawfordsville, respectively. “These guys took advantage of all the opportunities Wabash provides — made possible by your gifts to the College — and they will leave here as absolute world-beaters,” President White said. The annual gathering of the 1832 Society was held at D’Amore on the 48th floor of the Chase Tower in downtown Indianapolis. 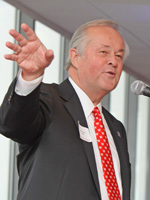 Long-time Trustee Joseph D. Barnette ’61 served as master of ceremonies. See photos from the event here. “This is an important event that recognizes your philanthropic leadership of Wabash College,” Barnette told the assembled crowd. The 1832 Society comprises alumni, faculty, staff, and friends of the College who make gifts of $1000 or more each year. Approximately 750 families support the College at the leadership level annually. 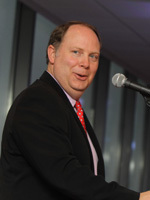 Dan Rogers, Associate Professor of Modern Languages and Chair of the Department, gave the keynote address. 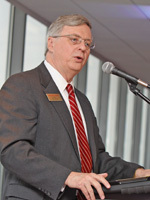 Rogers got more serious when he spoke in glowing terms of the faculty who, with him, came to the College in 1998. Included in that cohort of then-new faculty were chemistry professors Scott Feller and Ann Taylor, rhetoric professor Todd McDorman, and physics professor Dennis Krause. He likened each of them to legendary professors through the ages, quoting Byron Trippet. Indeed, all five of those professors are well on their way to legendary status, for example Dr. Feller was recently named Lloyd “Doc” Howell Chair in Chemistry and Dr. Taylor holds the Haines Chair in Biochemistry. Director of Annual Giving Joe Klen ’97 said the 1832 Society dinner celebrates the link between the tradition of philanthropic leadership and the opportunities for students and faculty such giving provides.